Would You Like To See London’s Christmas Lights From Onboard a Vintage Red Routemaster? During December, experience a showcase of London’s breath-taking Christmas lights from an iconic London bus. Our brand new “Service C” tour will take you across the world famous Oxford Street at multiple points, down Regent Street into Piccadilly Circus, and onwards to Trafalgar Square, to see the historically important Christmas tree which is a gift from Norway due to Britain support in WW2, then down the Strand, before returning via Hyde Park Corner and Winter Wonderland. The journey will last around an hour & 15mins, and include your Guide David with commentary and a traditional bus conductor with ticket machine. It’s an experience not to be missed – a tour of London’s best spots from a stunning head-turning Routemaster. • Marble Arch, Coach Bus Stop, 119 Park Lane, Mayfair, W1K 7AG (outside Fine Country estate agents). The Tour will depart from Marble Arch at the time shown on your ticket. Please make sure that you allow plenty of time to get to the departure point. I will already be at Winter Wonderland and want to go on the Tour? The Marble Arch stop is located on the Southbound side of Park Lane. This is very close to Hyde Park so why not take a break from the park and explore the lights and sights of Christmas London on a warm heritage Red Routemaster bus. I am going shopping in Oxford Street and want to go on the tour to see the lights? The Marble Arch stop is located on the Southbound side of Park Lane which is only a short walk from Oxford Street. After the Tour has done the lights and sights, I wish to go to Winter Wonderland? The Tour bus will make two stops on the Northbound side of Park Lane, which is next to Hyde Park, so that you may alight to go into Winter Wonderland. If traffic is light we expect the Tour to take around an hour: if the traffic is heavy the Tour will take longer. What can/can't I bring on the Tour Red Routemaster bus? Opened alcohol & hot food are not permitted on the Tour bus. Soft drinks must be in plastic bottles. Carrying pushchairs and shopping trollies? The carriage of folding pushchairs is at the discretion of the conductor and where permitted (a max of 2 small pushchairs per trip), these must be stored in the luggage space under the stairs. Shopping trollies cannot be carried. The Tour is operated by heritage buses which are non-wheelchair accessible. Only folded wheelchairs can be carried. Do I have to bring my printed ticket with me? Printed or Digital tickets shown on your mobile device will be accepted. 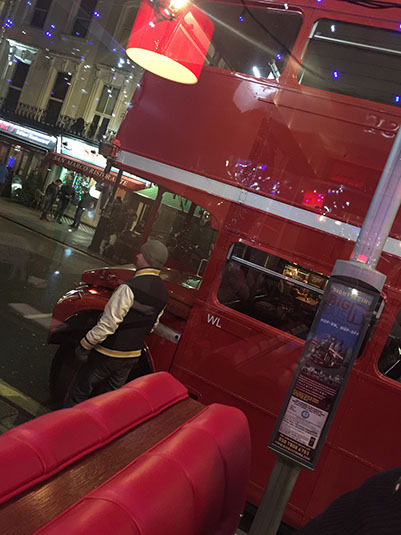 Do you have any questions about Service C - London’s Leading Family Christmas Light Bus Tour? If you do, please Contact ServiceC by London's leading RedRoutemaster bus hire company. Key Route Information for Service C – This is a circular route. Marble Arch, Coach Bus Stop, 119 Park Lane, Mayfair, W1K 7AG (outside Fine Country estate agents). Not all times or dates will be available. Tickets on sale now limited availably.